It happens. Sometimes a mend job gives out and needs to be mended again. I tore a hole in my jeans and in my knee when I fell off my bike in 2008. 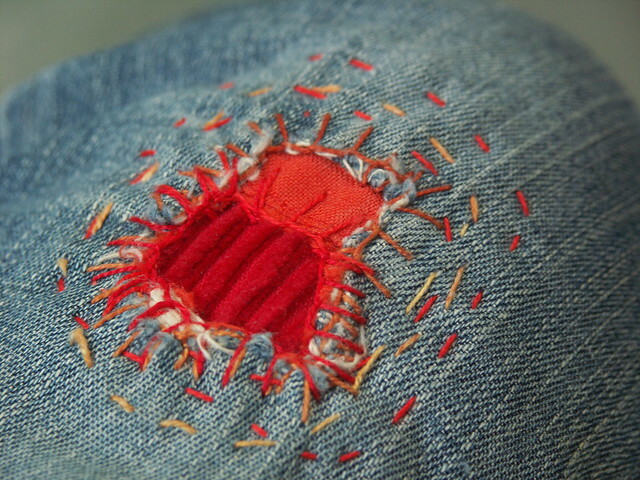 I patched the hole with a bright orange linen. Four years later I had to patch the patch. This time with a bright red wide-wale corduroy. If you had x-ray vision you could look through the jeans, through the linen, through the corduroy to the little patch of scar tissue on the corner of my knee!